After the lavender gladiolus have come and gone, these beautiful yellow ones came. 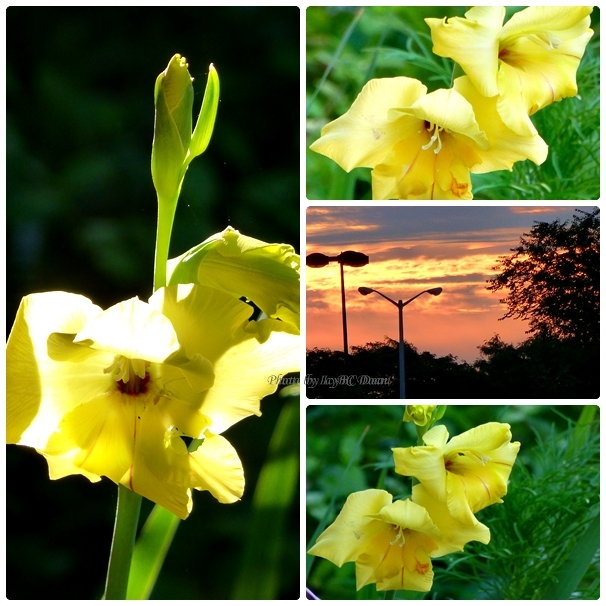 It had less flowers on its stalk, but the yellow was very rich, and like its sister, this stalk of yellow gladiolus was very wimpy. Lesson from nature you could say; that not all the healthy and strong stalks can beat the weak and small ones. The intense colors in the sky was also amazing this week when it was not raining or cloudy. We are definitely in fall weather as all the flowers becoming brown and dying out. Not sure if I am ready to embrace the cold, but as life has it, we just have to keep moving forward. Have yourself a wonderful new week.. I didn't even get to see my yellow ones this year. They were in hiding. I can imagine your place filled with flowers, icy, must be like heaven each time they bloom. Ah, such beauty harmonizing together. Beautiful photos. I love gladiolas, whatever their color. brave the cold for now, am sure you'll get used to it.